In the ideal world, Snapchat would be the app equivalent of ‘Logan’s Run’, with people over 30 evaporated by lasers if they attempted to use it. But we’re not in the ideal world, so I – an internet geriatric of 31 – am allowed to use it. What I like and dislike about it will probably enrage the ‘real’ millennials who are snapping their lives incessantly. Most of UX/UI decisions Snapchat makes are baffling to me. The app design seems like the product of a crazy cult that believes making the user journey easy-to-understand insults their ancient gods. I don’t really care about sending snaps to people or receiving them. I prefer to share my photos on Instagram or Twitter. But, the thing I do like – and which practically everyone else seems to hate with a volcanic passion – is Discover. Snapchat’s expanding selection of stories from media companies and – urgh – brands is entertaining and there are lessons for every publisher lurking in its design. Discover’s combination of sound, GIFs, looping video, static images and overlaid text is inventive in a way that most mobile news site design just isn’t. I love the journey through different publications’ stories and the way that they are obliged to select a series of items to share for that day. The Discover partner roster is expanding to include Vox.com and BuzzFeed. That’s great news. Both of those sites have a strong track record in experimentation. BuzzFeed’s News app is arguably the best one out there right now and I’m keen to see what it does with the tools and constraints Snapchat offers. I get why ‘teens’, millennials and other short-tempered, short-attention span types don’t like Discover. Snapchat exists for them to create their own stories and share snaps with friends. 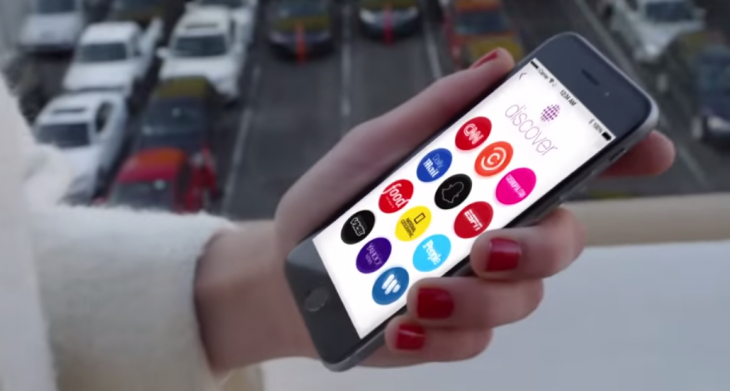 The presence of media companies feels like an intrusion to most snapchatters. But I’d love to use Discover in a standalone app, with a lot more channels available. I know that will never happen. There are some things that Snapchat could change though. For one, it should also be easier to share links to Discover stories with people outside the Snapchat ecosystem. I actually would.